Do you accept PayPal payments? If you do, or plan to (always a good idea, especially if you have the ambition to sell internationally), read this. But if you send the item ostensibly paid for – you will be out of pocket. What exposes the message pictured here as fake? The first give-away is the poor grammar and awkward formatting. However, you’d be well advised not to rely on these outward signs. The scammers are becoming more and more sophisticated; one of these days, they may even learn to use proper business English. Then there is the spoofed email address. Do note that the spoof is not always as obvious as in our sample. 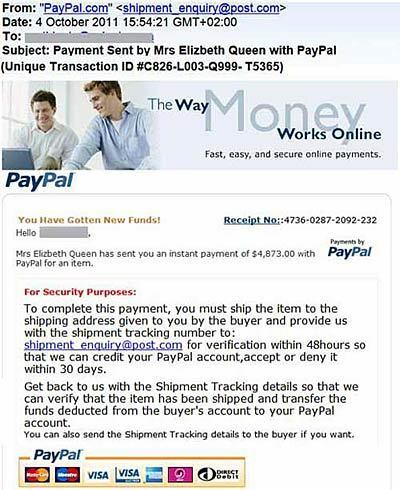 (The scammers slipped badly with this line: From: "PayPal.com" <shipment_enquiry@post.com>.) A good way to check where the message is coming from is to press the reply button and carefully study the “To” field. With spoofs, the email address displayed in the “To” filed will be different from the purported email address, displayed in the message heading. Do note that changes can be subtle; for example, someone@paypal.com is not the same as someone@paypal1.com. In order to detect these differences, you need to know the genuine email address. So, arm yourself with knowledge! And, finally and most importantly, there is your PayPal account. Each and every time you receive a “payment made” message, open your browser, type in the PayPal web address (do not click on a link that may be in the email message), log in and check the transactions. If the money is not in – do not send the goods. The same advice, of course, goes for all other forms of payment. Money in your account is the only proof of the pudding you can rely on!